BostonBruins.com - All of the Bruins were back on the ice Wednesday at Ristuccia Arena in Wilmington for a short practice, following a five-game road trip, in which they posted a 4-1-0 record. The B’s lines and D-pairs remained the same as they began to prepare for their first game at TD Garden since a February 12 shootout loss to the New York Rangers. The Black & Gold will face off against a red-hot Ottawa Senators team Thursday night, that will enter the contest riding a five-game winning streak. 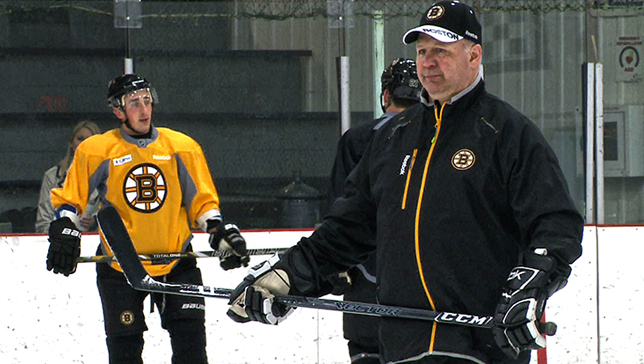 But, the B’s will be trying to build off their own momentum, as they head into the busy part of their schedule. At 12-2-2, and with at least three games in hand on every team in the Northeast Division, the Bruins have put themselves in a great position heading into the final 32 games. Currently, there is a whole lot of attention being paid to the stats of Marchand, who leads the team with 10 goals – on just 29 shots, good for a 34.5 shooting percentage. The Little Ball of Hate also leads the B’s with three game-winning goals. Marchand says his uptick in goals is not a result of him doing anything different from past seasons. He credits his teammates and a lucky bounce here and there as the main reasons for his success. “Goals come in bunches,” said Marchand, who potted his 10th goal in the B’s 4-1 win over the Islanders Tuesday night. “When you’re hot, things go in. Then there will be times where you go through a span where you have about 20 games without a goal and it’s just how it is. “I’m not doing anything different from the past two years. Pucks are bouncing the right way right now. I’m not really thinking anything of it. I play with two great players that make a lot of great plays. The tough to match-up against B's have shown their talented depth through the first 16 games of the season, but not necessarily in goal scoring - more in taking pride in contributions on all areas of the ice, including their two-way play. "I think everyone pulls on that same rope for the one common goal to get the win," said Chris Bourque, who put two shots on goal in the win over the Islanders and collectively saw his line with Rich Peverley and Chris Kelly fire six shots on Evgeni Nabokov. His linemates also play key roles in the B's near perfect penalty kill which sits at the top of the league. "It doesn't matter who scores. I think every lines going to contribute one way or the other, whether it's scoring goals, creating energy, or playing solid defense." "Right now we're playing good hockey and hopefully we can keep it going." "Since Day 1, I'm sure every guy in the league has been saying their team wants to establish their identity. I think we've done that. I think we're playing very well," added Seguin on the team's 12-2-2 record, despite sitting about midway through the pack with 49 goals scored this season. "Hard not winning by too many goals every game, but just playing solid hockey."